The rate of the sun's spin depends on how close to the star's equator the measurement happens, with the midline rotating faster than regions to the north and south. Distant stars appear as pinpricks of light in our sky, but we know from our own sun that there's a lot more going on inside of them. And new research adds to that picture, identifying stars with incredibly strange spinning patterns. In these stars, material at the equator spins much, much faster than the stuff found farther north or south in the star. To picture it, imagine if Earth's equator experienced two sunrises and sunsets every day at midlatitude locations like New York or Buenos Aires, Argentina. Our own sun also spins fastest at the equator but not to such an extreme degree. Our sun experiences a phenomenon called latitudinal differential rotation, which is just a fancy way of saying that different regions of the star spin at different speeds depending on how far from the equator they are. 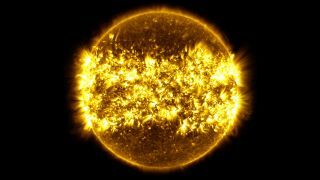 Material at the sun's equator rotates about 11 percent faster than material found halfway up our sun, say at about 45 degrees north or south. And the difference is even starker at the poles; the equator rotates about 30 percent faster than these regions. Rotation isn't just a neat trick: It also affects a crucial characteristic of a star, its magnetic field. In general, the faster a star spins, the stronger its magnetic field is, but that can get more complicated when a star displays stark differences in speed at different latitudes. So, a team of scientists set out to see whether they could spot this phenomenon on other stars. To do so, they turned to data from the Kepler space telescope's first mission. Although that instrument is better-known for spotting thousands of exoplanets, it also happened to provide data that was uniquely suited for a technique called asteroseismology. This method requires data about the same stars over a long period of time, the sort of data that's hard to get from Earth. "In space, you have continuous data," study lead author Othman Benomar, a stellar scientist at New York University Abu Dhabi, told Space.com. Having "these four years of continuous data is really what enables us to study the differential rotation. Without these four years, it wouldn't have been possible." Benomar and his colleagues looked at how waves travel through stars, a motion that causes tiny changes in the stars' brightness. He said it's a little like the Doppler effect, in which light and other waves become shorter or longer depending on whether their source is moving toward you or away from you. Waves within stars become shorter or longer depending on whether they're traveling in the same direction that material is rotating or opposite that rotation. The team was able to spot latitudinal differential rotation in 13 of those stars, with a few showing the phenomenon so strongly that their equators rotated twice as fast as their midlatitude regions. (For the remaining stars, the researchers didn't have data precise enough to measure whether differential rotation was occuring; they could find only the average rotation.) These stars may require an as-yet-unknown phenomenon to handle their magnetism and keep it from interfering in this rotational phenomenon, the researchers said. Despite these findings, scientists using asteroseismology in work like this face a huge data problem. Kepler lost the ability to do the required long-term, continuous data-gathering back in 2013, when a mechanical problem made the telescope unable to keep a steady gaze across the heavens. And NASA's new planet-hunter, TESS, doesn't take this kind of continuous data either. "That's something we might not be able to measure for decades," Benomar said. That's because the next telescope that will be able to produce this type of data is the European Space Agency's Planetary Transits and Oscillations of Stars (PLATO) mission, currently scheduled to launch in 2026. "Clearly, it will be modeling for the next few years at least," Benomar said. And that's a shame, because measurements like these often spur new scientific discoveries. "I think we learn more about the observations that kind of perplex us than the observations that verify what we already know," Weber said. The research is described in a paper published today (Sept. 20) in the journal Science.